Located along the banks of the Red River and Normand Creek in south St. Vital, Henteleff Park continues to pay tribute to the area’s rich history with the official opening of its new Interpretive Centre on Saturday, August 27, 2016 at 1:00 pm. Please join me at this grand opening and celebration – everyone is welcome to attend! In keeping with the Foundation’s overall objective of its park being a place of both serenity and learning, the Interpretive Centre will focus on four themes. It will showcase the unique natural landscape, plant and bird life that inhabit the park; pay tribute to the major role that Métis families played in settling and developing the community; highlight the history of market gardening in the area, and share the Henteleff family story and the contributions they made along with other Jewish farm families in Manitoba in the development of the community. Located at the park’s entrance at 1964 St. Mary’s Road and near the original homestead of the Henteleff family, the Interpretive Centre will feature a Shelter Building that will display panels of information that will lead to a new circular pathway with additional information panels, all-­‐weather notebooks, new bench seating and landscaping. 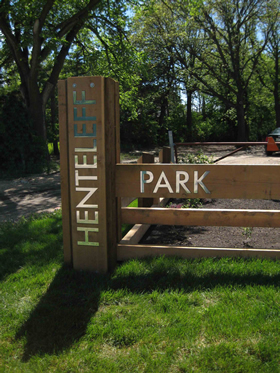 Since the Henteleff Park Foundation was established in 2002, a city-­‐wide network of dedicated volunteers have worked tirelessly to make the Henteleff Park dream happen. Volunteers over the last 10 years have planted over 5000 trees and shrubs, have established 3 km of trails, have raised funds to rehabilitate Normand Creek so it is now an excellent spawning creek, and have sustained the efforts of the Henteleff Park Foundation to ensure the park is a place of beauty.